ESPN Nets its Largest Heisman Audience Ever - ESPN Press Room U.S.
ESPN continues to experience audience growth for its college football programming, posting its highest-rated and most-viewed Heisman Trophy Presentation telecast ever and its highest-rated and most-viewed coverage of The Home Depot ESPNU College Football Awards in more than a decade. The home designated market areas (DMA) of the schools that will square off in the Citi BCS National Championship game (No. 2 Texas vs. No. 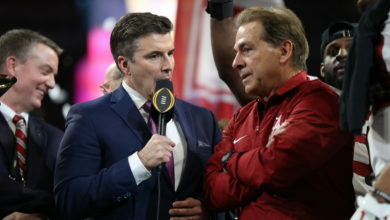 1 Alabama on Thursday, Jan. 7, at 8 p.m. on ABC) posted the highest metered market ratings: Birmingham, the DMA of Alabama and Heisman Trophy winner Mark Ingram, averaged a 17.8 rating while Austin, DMA of Texas and Heisman Trophy finalist Colt McCoy, averaged a 10.6. It was ESPN’s highest-rated Heisman Trophy Presentation in both markets since 2003. ESPN’s coverage of The Home Depot ESPNU College Football Awards (Thursday, Dec. 10, at 7 p.m.) averaged a 1.2 rating, 1,166,000 households and 1,593,000 viewers, making it the network’s most-viewed college football awards telecast since 1996 and highest-rated since 1997. It experienced increases of 33% (vs. 0.9 rating), 38% (vs. 845,000 households) and 48% (vs. 1,076,000 viewers) over last year. ESPN averaged 2,144,000 households, 2,874,000 viewers and a 2.2 rating, making it the most-viewed season since 1994 (2,197,000 households and 3,107,000 viewers) and highest-rated since 1999 (2.3 rating). This year saw increases of 11% (vs. 1,931,000), 12% (vs. 2,561,000) and 10% (vs. 2.0), respectively, over last year. ESPN2 experienced its most-viewed season ever, averaging 1,110,000 households and 1,492,000 viewers for increases of 8% (vs. 1,028,000) and 11% (vs. 1,350,000). ESPN2 averaged a 1.1 rating for both seasons. ESPN’s Saturday morning College GameDay posted its most-viewed season ever, averaging 1,711,000 households, 2,034,000 viewers and a 1.7 rating for increases of 14% (vs. 1,504,000), 12% (vs. 1,815,000) and 13% (vs. 1.5). The previous high was set in 2007. In addition, the ESPN Films “30 for 30” project The U, which followed the Heisman Trophy Presentation telecast, was the networks highest-rated documentary ever with a 1.8 rating, 1,800,000 households and 2,368,000 viewers. The fall slate of seven “30 for 30” films averaged a 1.0 rating, 1,007,000 households and 1,258,000 viewers.